PHOTO BY STEVE WILLIAMS Carey’s Griffin Summit uses his body to shield off a Seneca East defender as he drifts through the air on his way to the basket Friday. CAREY — Indications are the Carey Blue Devils have found their game and that could throw an interesting twist to the second half of the Northern 10 Athletic Conference race that is about to begin. 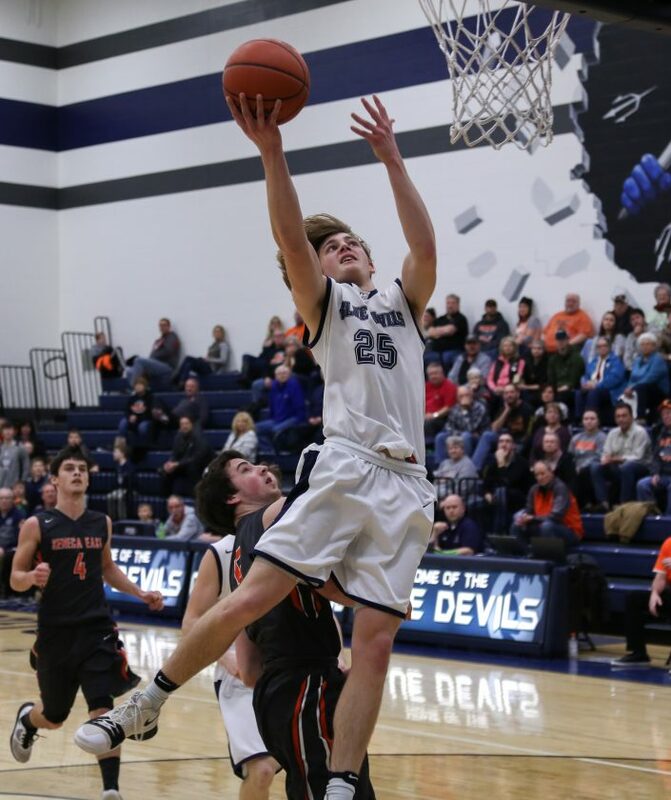 The Blue Devils roared past Seneca East 75-43 here Friday night for their sixth straight victory to set the stage for some top of the conference battles in the coming weeks. “In the beginning of the season, we just weren’t clicking right and now it’s slowly starting to come together,” coach Jamie Young said after his club improved to 8-4 overall and 6-2 in conference play, two games behind leader Mohawk. The Blue Devils dropped four of their first six games in a frustrating series of almost-but-not-quite starts. Scoring bursts over the last five minutes of the first two quarters laid the foundation for Carey. The Blue Devils outscored Seneca East 14-2 over the final 4:49 of the first period and put together a 15-4 run over the final 5:11 of the half to double up the Tigers 34-17 at the break. Hayden Stone, Carey’s 6-foot-8 junior post, was at the center of both runs. Stone, who finished with 26 points, 14 rebounds and two blocks, scored his team’s first eight points and had 12 in the first period and five more in the spurt to close the half. Jordan Dasher, the only other Carey scorer in the first period, added a couple buckets in the second frame off passes from Griffin Summit (eight points, six rebounds) and Cade Crawford. Dasher finished with 13 points. Carey’s man-to-man defense drew 10 turnovers and limited the Tigers to 6-for-17 shooting in that span. “Honestly, I thought we handled the press all right, but in the half-court, we had some problems,” Seneca East coach Chris Long said. “They get after it and if you’re not ready to respond and play the same way they are, this is what’s going to happen. The margin stayed at 17 points three minutes into the second half before Casey Crawford scored all 11 of his points, including three straight 3-pointers over a 53-second span to put the game away. Seneca East could get no closer than 18 points the rest of the way. At the offensive end, Tyler Turek had 14 points and nine rebounds to pace Seneca East. DJ Ruffing added eight points for the Tigers. Carey’s league losses were by one point to Upper Sandusky and six to Mohawk, both on the road. The Blue Devils get their second chance at home this week — Thursday against the Rams, who dropped into tie for second with Carey after a one-point loss to Colonel Crawford Friday, and Saturday against the Warriors. “We’re concentrating on Thursday’s game and if we can win that, we’ll go from there,” Young said.